Shenzhen, China-based hardware brand Lofree is slowly making a name for itself in the world of tech accessories. 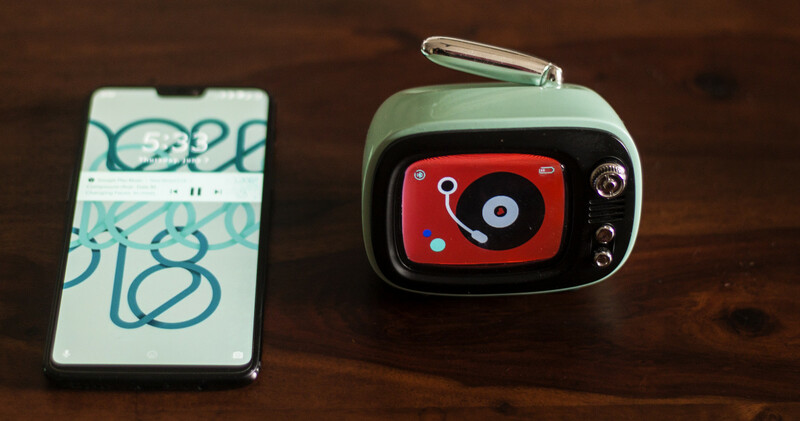 Its latest offering, the QTV alarm speaker is absolutely adorable, and could make for a great addition to your nightstand – or a gift for people who enjoy retro design. The company is presently crowdfunding the QTV via Indiegogo, which means you’re taking a bit of a risk when you place an order. That said, Lofree has made good on its previous promises to deliver a larger speaker and a wireless mechanical keyboard, so it should hopefully be able to ship this on schedule by July as well. Here’s what you get for your money. The QTV is only a little larger than a tennis ball, and takes cues from the industrial design of chunky television sets from the 50s – complete with an antenna and a functional knob. The body is coated with a zinc alloy, and comes in four bright colors. My review unit came in the same light pastel shade of teal as the Lofree Poison speaker and keyboard that I’d previously written about, which made for a fun little photo shoot. The QTV looks positively delightful, and is fairly well built – but I’d have appreciated the use of metal for the knob and buttons in place of plastic with a faux chrome finish. And while the antenna is cute, it makes the speaker less portable than others on the market because it may not withstand a tumble in your backpack while traveling. The QTV connects to audio sources only via Bluetooth, and includes a color screen to display a clock, a customizable alarm, and for some reason, a timer. That odd collection of features makes it a bad choice for a travel speaker, but it should serve well as an alarm clock on your nightstand. You can record audio via the built-in mic and set that as an alarm tone. The whole setup is rather unintuitive, as the buttons aren’t labeled, and navigating between the alarm, clock setting, and timer functions took longer to get used to than I’d have liked. The antenna acts as a snooze button, and also brings up some old-timey cartoon clips on the screen if you long-press it. Those are likely intended to push the whole retro TV concept further, and they make for a fun little easter egg – particularly if you’re partial to Popeye. Overall, the QTV is a lot less than it could have been. The screen and built-in mic could have been put to greater use for things like displaying track info, caller ID, and answering calls. But it does none of that, and its few basic auxiliary features aren’t easy to use without consulting a manual. The QTV sounds decent enough and gets about as loud as similarly sized devices such as the JBL Go and Logitech X100, which means it’s fine for watching Netflix in bed or cranking out tunes in the kitchen while you cook. As with the larger Poison speaker, the QTV tries just a bit too hard with its bass output, leading to a small amount of distortion at its highest volume. That’s a bummer, but not a deal-breaker for a novelty speaker. Lofree says you’ll get about five hours of playback on a full charge, which is about the same as the aforementioned rival speakers. However, I found that I rarely unplugged the QTV from its microUSB charger by my nightstand. 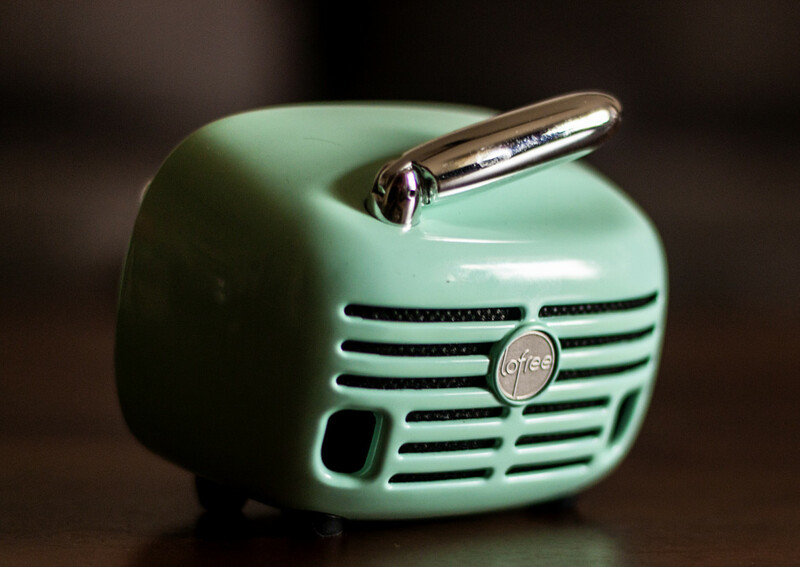 The QTV is easily the cutest little speaker I’ve ever had the pleasure of reviewing, and that makes it a great gift for anyone who’s nostalgic about the good ol’ days of CRT televisions and mid-century design. However, it’s not as portable as other Bluetooth speakers, and its interface leaves a lot to be desired. And if you’re looking for an alarm clock, there are options that are easier to use, like the $100 JBL Horizon. So yeah, this is mostly just an eye-catching little wireless speaker for your bedroom. Lofree is presently offering the QTV for $64 on Indiegogo; the company says it’ll begin shipping in July, and the speaker will later go on sale at $99. Check out more pictures and information on the company’s official site.